An additional source of omega-3-polyunsaturated fatty acids, providing for immunity boosting, normalizing cardiovascular system functioning, improvement of ZNS function, prevention of premature ageing; it has antioxidative properties. 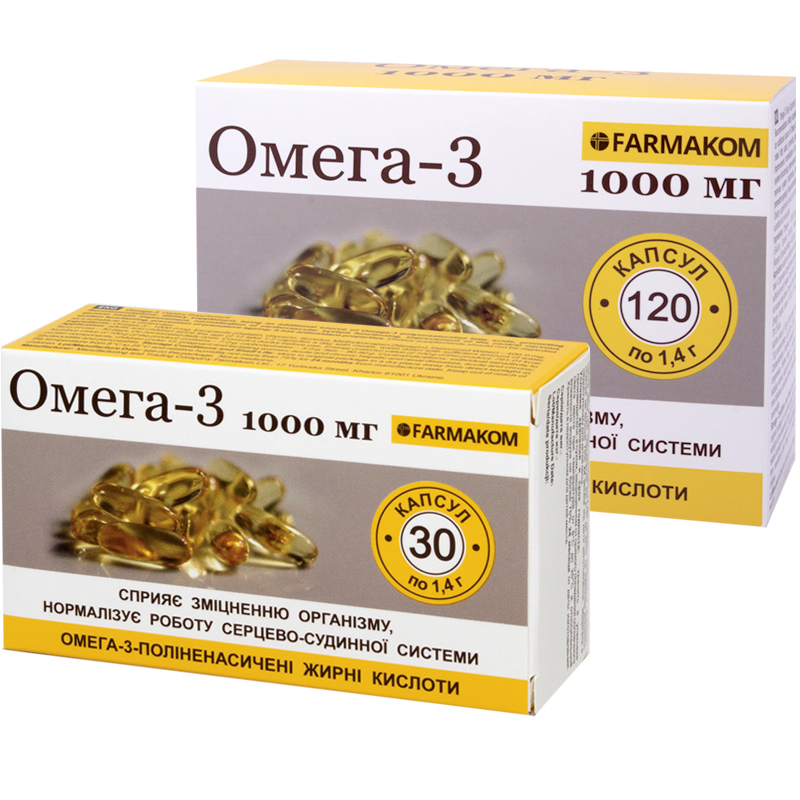 Omega-3 – 1000.0 mg, excipients (gelatin, glycerol, sorbitol, methylparaben (nipagin), purified water) – 400.0 mg.
Omega-3 fatty acids form a complex of nutritive substances, including eicosapentaenoic acid (EPA) and docosahexaenoic acid (DHA).Omega-3 supports correct functioning of the viscera; improves mental functions, eliminates toxins, wastes and carcinogenic substances from the body. These acids prevent atherosclerosis and other cardiovascular diseases (eliminate excess cholesterol and dissolve cholesterol plaques, narrowing vascular lumen), reduce vascular permeability and make the vessels elastic, normalize blood pressure, thin blood, preventing clots formation. This complex is an important component for prevention and treatment of osteoporosis. It helps regenerating cells thus accelerating healing of wounds and burns, cicatrization of gastric and duodenal ulcers. It boosts immunity; makes allergic reactions and depressive states less prominent; improves mental activity and memory. It hampers ageing processes. Adequate function of the nervous, immune and cardiovascular systems, adequate synthesis of tissue hormones, prostaglandines, correct metabolism of essential substances is impossible without these compounds. In addition, omega 3 fatty acids inhibit inflammatory processes, improve state of the joins, help fighting emotional disorders, chronic fatigue syndrome. Adults and children since the age of 12 take 1-2 capsules a day with food, wash down with sufficient amount of liquid. Term of use – 1 month. Do not exceed daily dose. Individual sensitivity to certain components, children under 12, pregnancy, lactation, acute and chronic liver and kidney diseases, acute and chronic cholecystitis and pancreatitis. Proteins – 7 g, carbohydrates – 5,0 g, fats – 80,90 g.